Beginning at the Missouri state line south of Joplin, via Wyandotte, Grove, Jay, Tahlequah, Fort Gibson, Braggs, Gore, Webbers Falls, Warner, Porum, Whitefield, Stigler, Keota, Panama, Poteau, Wister, Talihina, Albion, Tuskahoma, Clayton, Antlers, Hugo, Grant, and south to the Red River bridge towards Paris, TX. Route 10 in the original Oklahoma numbered highway system was the easternmost of the full north-south crossing routes; in its role as part of the second tier of trunk line roads, it knitted together the eastern hill country and allowed for relatively easy travel between Ottawa County and the Red River. However, likely due to the undeniably interesting nature of the terrain it traversed, Route 10 was also the most winding of all the original crossing routes. 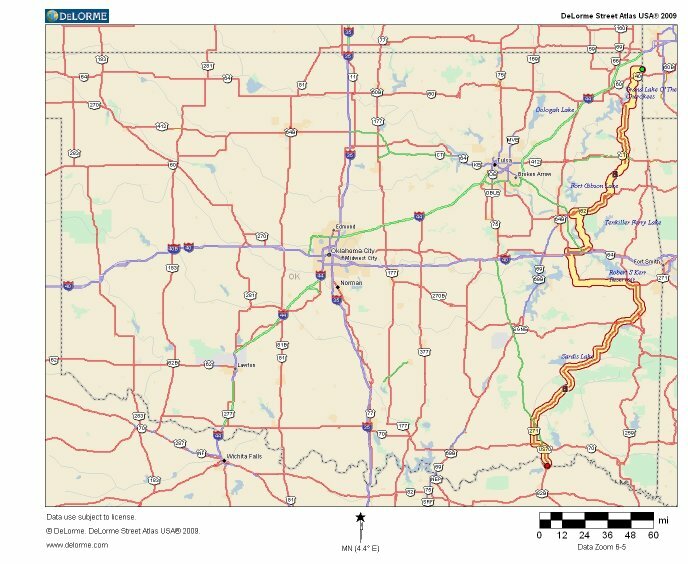 In addition, unique among the crossing highways, Route 10 shared several lengthy concurrences with other major routes, all presumably in an effort to efficiently utilize the few "good roads" then existing through the hills and mountains of far eastern Oklahoma. The following depicts a theoretical approximation of the original Route 10 if it existed today using modern highways. 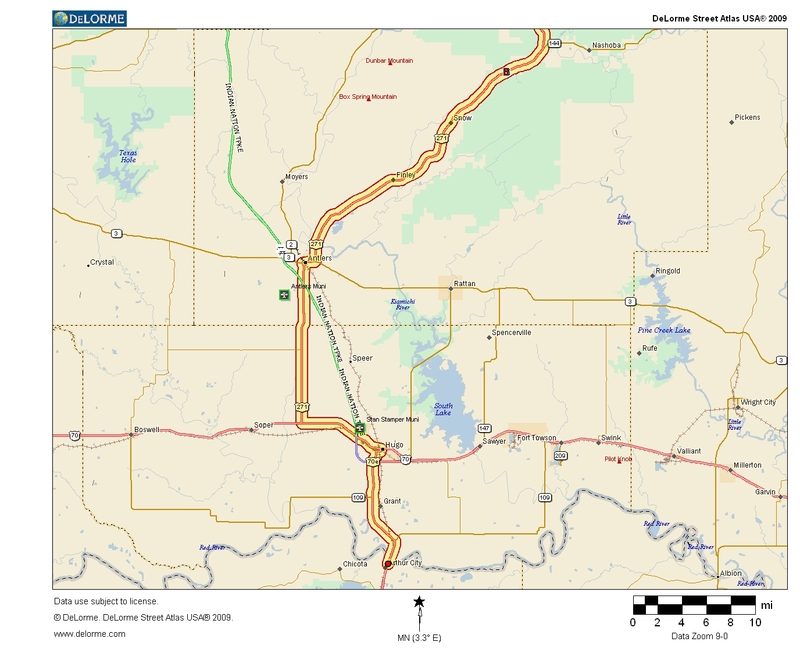 A hypothetical modern version of the original Oklahoma Route 10 would begin at the Missouri border in Ottawa county on modern State Highway 10C and run west with the modern spur for a few miles before joining the parent highway, the modern SH 10. From this point south, the happy occurrence of the highway's original number being retained for its entire life persists for quite some distance. Route 10 would follow along as itself alone past Wyandotte and all the way into Grove; at that point, US 59 joins the road, but the original Route 10 is still signed as itself as well (SH 10) as the highways continue south. SH 20, another original route that has retained its number, joins the road briefly before US 59 and SH 10 (Route 10) break off again bound for points further south. At Kansas, US 59 turns away to the east, leaving Route 10 to continue south as itself alone again (modern SH 10). After traveling along the very scenic Illinois River valley for a distance, Route 10 and its modern counterpart join with US 62 and SH 51 to travel into Tahlequah. 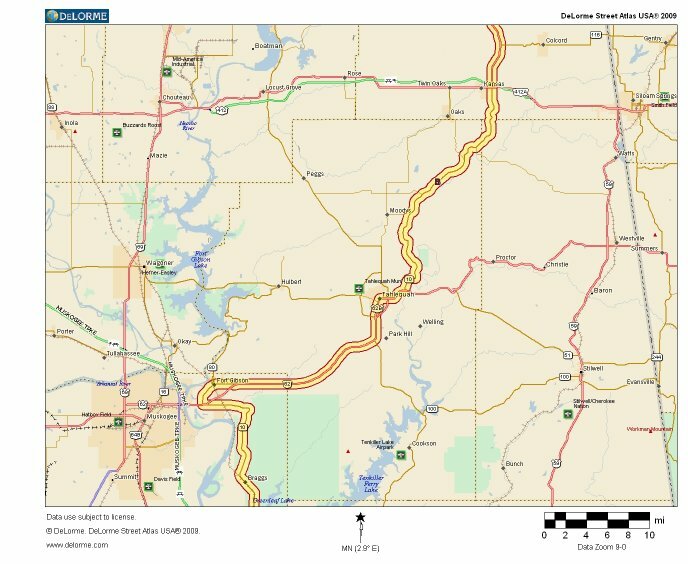 After taking the business route through town, Route 10 follows SH 10 and US 62 as they break away from SH 51 to travel south toward Muskogee; Route 10 and SH 10 then split from US 62 to pass through Fort Gibson before winding south toward Braggs. Route 10 would continue south (as SH 10) to Gore, where it joins US 64 as the modern SH 10 comes to an end. Though the stretch of original numbering ends here, another interesting situation begins; at this point, Route 10 would become concurrent with a modern version of original Route 1, the first of many original 1925 major route concurrences along its path. After following with US 64 (and Route 1) for a short distance, Route 10 would split off at Warner and instead follow modern SH 2 south through Porum to Whitefield; at the point where Route 10 joins SH 2, it ceases to be concurrent with Route 1, but immediately becomes concurrent with original Route 9 instead. This concurrence continues when Route 10 turns onto modern SH 9 at Whitefield, where Route 9 has maintained its original number. A theoretical modern Route 10 would follow along SH 9 (and Route 9) through Stigler and Keota, with US 59 eventually rejoining Route 10 west of Spiro. At the junction with US 271, Route 10 loses its concurrence with Route 9 as Route 10 turns south to follow US 59 and US 271. Once again, however, one original concurrence is simply replaced by another; the instant Route 10 turns south with the two federal highways, it begins a concurrence with a hypothetical modern original Route 3. 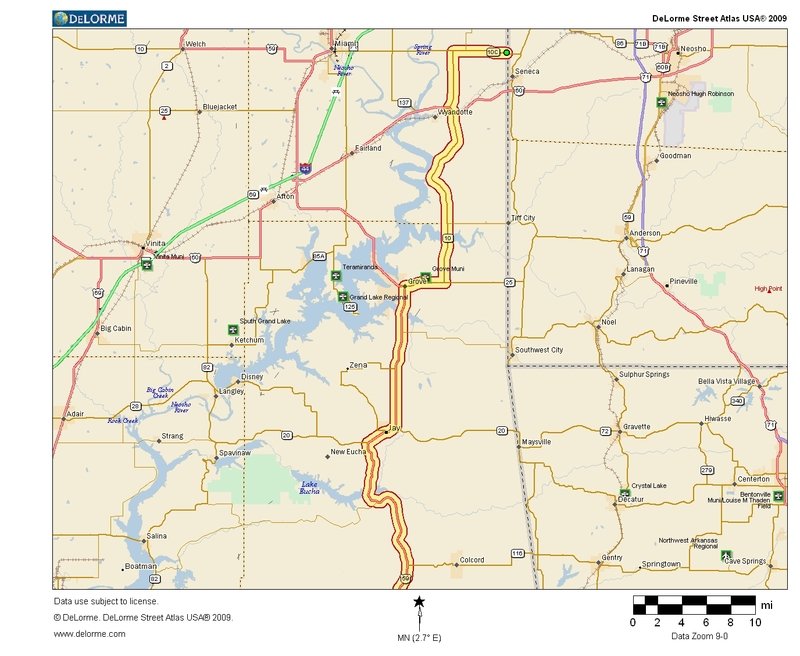 A theoretical modern Route 10 (and Route 3) would follow along US 59 and US 271 toward Poteau. 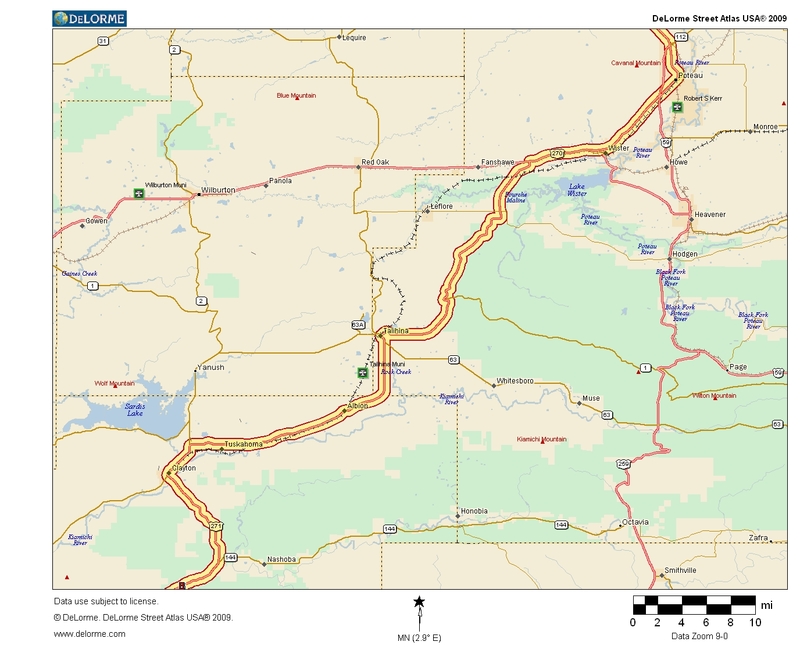 After following the business loop through Poteau, a theoretical modern version of Route 10 would follow US 271 toward Wister, where US 270 would briefly join the road before US 271 and Route 10 split off to continue south; at the split from US 270, the concurrence of theoretical Route 3 with Route 10 ends. Route 10 follows south along US 271 to Talihina, briefly picking up the modern SH 1 for the run into town before US 271 breaks south again, taking Route 10 with it. 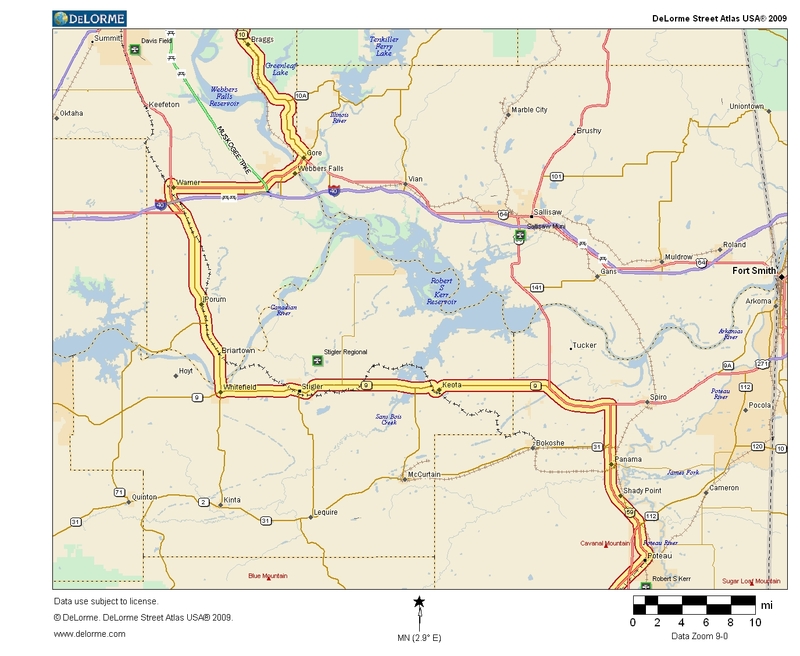 After following US 271 along the Kiamichi River past Albion and Tuskahoma, Route 10 is briefly rejoined by SH 2 as the three highways travel into Clayton, at which point SH 2 leaves the road again while Route 10 and US 271 break southeast. A modern Route 10 would continue following US 271 through the mountainous terrain toward Antlers and then south toward Hugo; just west of town, Route 10 and US 271 join with US 70 for the last few miles into Hugo. At the junction, Route 10 would also become concurrent with a theoretical modern Route 5, the last of its concurrences with its original brethren. After following the business route into town, Route 10 would follow with US 271 south away from US 70 (and Route 5) toward the Red River; at the Texas border, our hypothetical Route 10 would reach its southern terminus. As with several of its second tier brethren, Route 10 has managed to maintain its original number for significant portions of its length while being supplanted by US highways for other portions. The entire southern half of Route 10 was taken over by US 271, while the designation of other US routes in the northern half of the state led to further truncation of the original highway. The original path of the highway is still quite informative, however, with its many folds back on itself as it makes its way south. As anyone who has been there can attest, the terrain in eastern Oklahoma is extremely varied, with a myriad of elevation changes offering both great beauty for an observer and great challenges for construction. Carving a roadway out of the landscape is difficult enough today, so it is understandable that the original planners of the Oklahoma highway network made as much use of the roads in the area at the time as possible. The resulting pathway, taking as much of a "least resistance" routing as practical, still offers a challenge for vehicles today, but even in 1925 allowed travelers to successfully move between opposite ends of the state. We hope you enjoyed this look at the most sinuous of the original crossing highways. State Highway Shields created by Ken Parker of Oklahoma Bridge & Highways Group.